According to the recent public declaration made by our Economic Affairs Minister Lyonpo Leki Dorji, Bhutan has no other eggs, other than the hydro-power egg. Thus, it would seem like Bhutan’s hydro-power story is all about the egg and the basket. If so, it is important to take time off to examine how really bankable our hydro-power projects are. And, while bringing perspective to our hydro-power projects, by necessity, we must dwell on our two largest ongoing projects – the Punatsangchhu Hydro Electric Projects I & II. Another of Bhutan’s large hydro-power projects – the 720 MW Mangdechhu Hydroelectric Project Authority deserves mention – but for now I will limit myself to PHEP I & II. We believe we have 30,000 MW hydro-power potential of which 23,760 MW is said to be economically feasible. How many of you believe that this is still true and valid, in today’s context? The assessments were made about 3-4 decades back. And, in all likelihood, the assessments would have been made by WAPCOS, the principal Consultants to Bhutan’s disastrous hydro-power projects. Since the assessments were made, the world has seen severe climate change brought on by global warming. Our region is said to be experiencing warming rates that is 1.5 times the global average, causing huge glacial melt and altering rainfall patterns, which alter water-flows into our rivers. Because of this altered scenario, there is a need for a fresh study to determine our real potential, based on the latest climate data. May be our stated potential could be whole lot of air and not water. Bhutan is supposed to be a net exporter of electricity, exporting over 1,500 MW of electricity to India last year. But we are energy reliant; infact, we are electricity reliant. We have to import electricity from India during the winter months, at a much higher price than at which we exported to them. The government will tell you that this is in the nature of nature. It may be so, but we know that this is something that can be easily corrected. But we can’t be bothered. Even stranger, for a country that lists electricity as an exportable surplus, its citizens find electricity too expensive for use as an energy source for cooking and heating homes. Not out of choice but driven by compulsion, Bhutanese people waste many hours of their productive lives - queuing up at the fuel stations, trying to buy LPG and kerosene, for cooking and heating their homes. And what does the government do? Instead of solving the problem, they attempt to manage and bring some semblance of order to the throng that form at the fuel pumps. Tragic. The storage dams of the PHEP I & II, if they ever get built, will create huge water bodies that could alter weather patterns and trigger major earthquakes. And yet, our Disaster Management Department tells us that we are unprepared, in the event of a large earthquake. Bhutan is located in a seismically hazardous zone and the Great Himalayan Earthquake in our part of the world is said to be imminent. In addition, GLOFs are a clear and present danger, given the rate of ice melt that is recorded in our part of the Himalayan region. Bhutan has close to 2,800 lakes of which 25 are potential GLOFs. Even if we disregard all of the above, something that we cannot ignore is the fact that the PHEP I & II sits bang in the middle of a seismically high hazard zone. 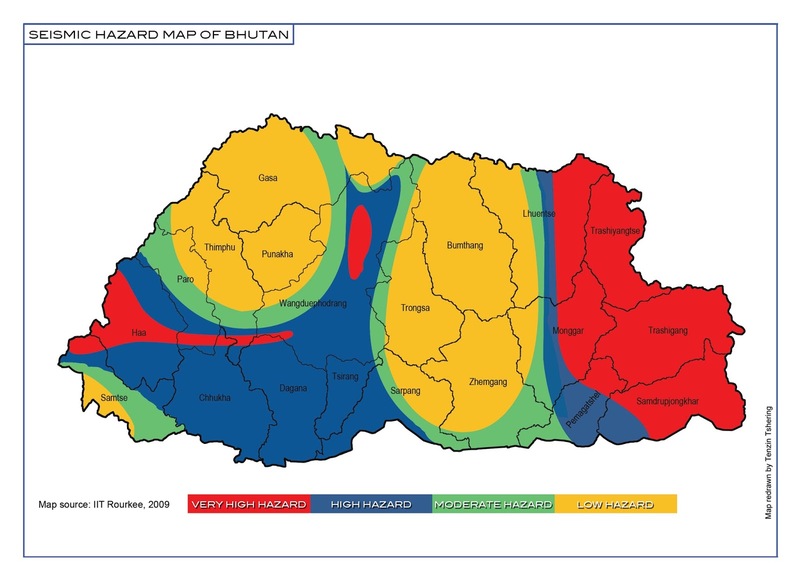 Take a look at the following Seismic Hazard Zone Map of Bhutan released by IIT, Rourkee, India. I am posting a high resolution image of the map so that readers can download and save it; please go ahead and do so – I have gone to considerable trouble and expense to redraw the map. How plausible is it that the Chairmen of the Board and the Board Members of the past and present PHEP I & II Board did not know of the precariousness of these projects’ location? There should be no doubt in anybody’s mind why these projects keep encountering all manners of “geological surprises”. From the original cost estimate of Nu.35.00 and Nu.37.00 billion, the final cost of construction of the PHEP I & II is likely to escalate by 400-500% of their original estimate. 70% of the final cost will have to be borne by the Bhutanese people in the form of loans – at a ludicrous interest rate of 10% per annum. And yet the government and the project authorities will tell you that the loans are self-liquidating – as if we are in the business of liquidating loans. If and when the construction of these disasters end and generation starts, we will find that their cost of generation would have shot through the roof and into the stratosphere. As of last year, it is said that the cost of generation at the PHEP I & II has already crossed Nu.4.00 per unit. The project completion date of these projects have yet again been pushed back to 2019 and 2022. You and I know that these dates will yet again be pushed back. This means the cost of generation will be somewhere in the region of Nu.9.00 – Nu.10.00 per unit, if not more. As against that, consider that our Dagachhu Project is said to be having a hard time selling their electricity at Nu.2.90 in the Indian market. But the government and the Project authorities will tell you that the arrangement is “COST+” – implying that cost is not an issue because we will get paid at the rate of COST+. We will have to watch and see if that will be true. In a single year, the bid for solar power in India fell from Nu.4.34 to Nu. 2.62 – a drop of 40%. Given that there is a strong push for renewable energy in India, the photovoltaic and wind turbine technologies are bound to make huge strides. As a result, it is most likely that the cost of generation in India will fall far below Nu.2.00 – by the time our disastrous PHEP I & II come on stream. This is the reason why India is now slowly shifting their focus from thermal and hydro plants to renewable energy - because this sector is all set to take on the leadership role. There are a few hundred things I can talk about on the sad state of affairs surrounding our hydro-power projects. But I won't go into them since most of them have been touched upon in my various earlier posts. For now let us shift focus to what is happening in India, our extended home market for everything, but most importantly, our sole market for our hydro-power egg. Our Hon’ble Economic Affairs Minister says that we have no other eggs – other than our hydro-power egg. He sees no other option, than to strive to put our most preferred “egg” into the Indian egg basket. So let us do a realty check on how bankable our hydro-power egg is, and how spacious our Indian egg basket really is.